A gifty impulse buy with actual substance for literary language lovers, Shakespeare fans, students and insult aficionados alike. 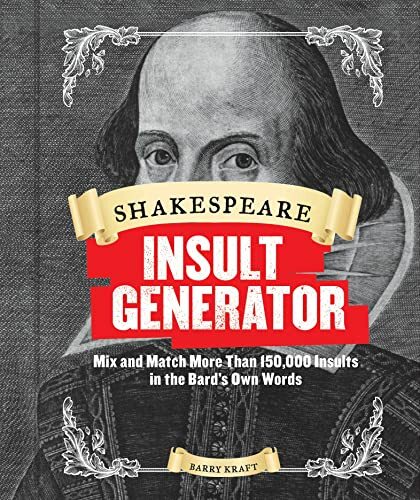 This entertaining insult generator takes inspiration from the English language's greatest wordsmith, collecting hundreds of the bards most powerfully insulting words in a fun, flip book format. Just add 'thou' before any of the 157,464 different insult combinations and you'll be ready to set dullards and miscreants in their place. From 'apish bald-pated abomination' to 'cuckoldly dull-brained blockhead' to 'obscene rump-fed hornbeast,' each insult can be chosen at random or customised to fit any situation in which a literary smack down is needed. Featuring an informative introduction on Shakespearean wit and notes on which terms are nonce words (words Shakespeare only used once in all of his writings) and terms that were likely coined by Shakespeare himself, this collection is sure to sharpen the tongue and wit of any student of the bard or insult aficionado.